Does your product come with the female end that plugs directly into my rv? How does it mount in the electrical bay? IF THERE IS NO POWER TO THE COACH, CAN IT BE REELED IN MANUALLY? Can this CRR50-12 Cord Reel be used with a 30 amp adapter? we have 30/50 on a 2013 holiday rambler vacationer? 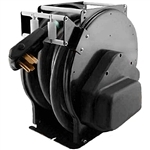 Can you reverse the connect male plug on the pigtail and female on cord end and the CRR50-12 reel work? Can i use my 50 amp cord with this reel if so what would price be. I own a 2004 HR Imperial 40PST. Will this freplace the original TDI and can it be installed without modifications? Is there a contact repair kit available for the reels?